Samuel Andrew Sellers married Ellen Blank. Married Name Her married name was Sellers. Ellen Blank married Samuel Andrew Sellers. Married Name September 1901 As of September 1901,her married name was Ohrt. Minna (?) married George Ohrt, son of George Ohrt and Magdalene C. Auch, in September 1901 at Nebraska. Eggert J. Ohrt was born on 21 September 1903. He was the son of George Ohrt and Minna (?). Eggert J. Ohrt died on 25 August 1968 at age 64. Russel F. Ohrt was born on 15 March 1907. Russel F. Ohrt died on 23 March 1909 at age 2. Leroy P. Ohrt was born circa 1911. Married Name circa 1884 As of circa 1884,her married name was Ohrt. Catharina (?) was born on 9 September 1855. She married George Ohrt circa 1884. Catharina (?) died on 13 November 1892 at age 37. Tim Ohrt was born on 1 June 1885. He was the son of George Ohrt and Catharina (?). Tim Ohrt died on 16 May 1889 at age 3. Johnnie Ohrt was born on 1 May 1887. Johnnie Ohrt died on 24 July 1889 at age 2. Timothy Ohrt was born on 21 October 1889. Timothy Ohrt married Ella R. Clausen, daughter of Fred Clausen and Virginia (? ), in June 1917. Timothy Ohrt died on 13 April 1951 at age 61. Maggie Ohrt was born on 22 August 1892. She was the daughter of George Ohrt and Catharina (?). Maggie Ohrt died on 18 November 1892. Married Name June 1917 As of June 1917,her married name was Ohrt. Ella R. Clausen was born in October 1892. She was the daughter of Fred Clausen and Virginia (?). Ella R. Clausen married Timothy Ohrt, son of George Ohrt and Catharina (? ), in June 1917. Ella R. Clausen died after 1930. Fred Clausen married Virginia (?). Married Name Her married name was Clausen. Virginia (?) married Fred Clausen. Vernelle K. Ohrt was born on 14 April 1923. She was the daughter of Timothy Ohrt and Ella R. Clausen. Vernelle K. Ohrt died in May 1985 at age 62. Alfonso W. Hatfield was born in April 1843 at New York. He married Adalaide E. (?) circa 1865. Alfonso W. Hatfield died after 1910. [S245] U.S. Federal Census 1900 U.S. Federal Census, by Ancestry.com, Year: 1900; Census Place: Rutland, Woodbury, Iowa; Roll T623_ 466; Page: 8B; Enumeration District: 161. Name Variation Adalaide E. (?) was also known as Adalade (?). Married Name circa 1865 As of circa 1865,her married name was Hatfield. Adalaide E. (?) was born in May 1846 at New York. She married Alfonso W. Hatfield circa 1865. Adalaide E. (?) died after 1910. Adalaide E. (?) had 2 with 2 living in 1900 children. Name Variation Eugene Hatfield was also known as Gene. Eugene Hatfield was born in 1871. He was the son of Alfonso W. Hatfield and Adalaide E. (?). Eugene Hatfield married Isora Margaret Mercer, daughter of Martin VanBuren Mercer and Harriet Adela Herrick, before 1893. Eugene Hatfield died in 1899. Leo D. Hatfield was born in 1893. He was the son of Eugene Hatfield and Isora Margaret Mercer. Leo D. Hatfield died in 1920. Edwin C. Johnson was born circa 1882 at Nebraska. He married Amanda Marie Westberg, daughter of John N. Westberg and Martha Helena Anderson, circa 1908. Married Name circa 1898 As of circa 1898,her married name was Westberg. Annie (?) was born in May 1874 at Dakota Territory. She married Richard Westberg, son of John N. Westberg and Martha Helena Anderson, circa 1898. Annie (?) had 1 with 1 living in 1900 children. Walter Westberg was born in September 1898 at Dakota Territory. He was the son of Richard Westberg and Annie (?). Married Name 27 October 1872 As of 27 October 1872,her married name was Cooley. Henrietta Mercer Cole was born on 17 May 1847 at Missouri. She was the daughter of Joseph Cole and Malinda Thornburg. 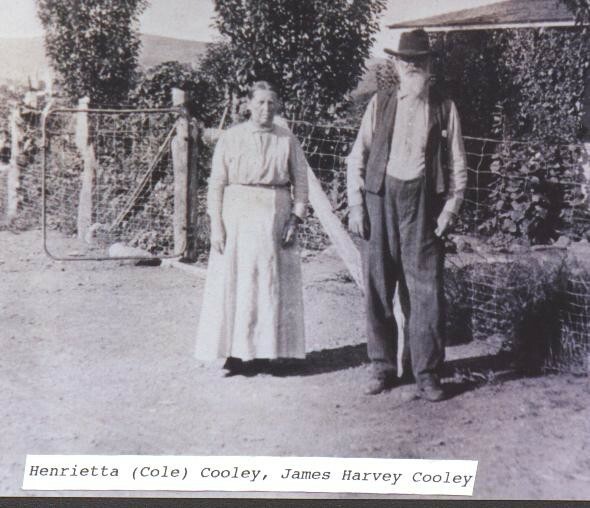 Henrietta Mercer Cole married James Harvey Cooley, son of James Cooley and Annie Christina Wyley, on 27 October 1872 at Leavenworth, Kansas. Henrietta Mercer Cole died on 4 April 1942 at New Mexico at age 94. Henrietta Mercer Cole and James Harvey Cooley were photo of James Harvey and Henrietta Cooley. Joseph Cole married Malinda Thornburg. Malinda Thornburg married Joseph Cole. Name Variation George G. Kinloch was also known as Kinlock. George G. Kinloch was born in October 1895 at South Carolina. He was the son of Dr. Edward Jenner Kinloch and Marie W. (?). [S245] U.S. Federal Census 1900 U.S. Federal Census, by Ancestry.com, Year: 1900; Census Place: Charleston Ward 5, Charleston, South Carolina; Roll T623_1520; Page: 14A; Enumeration District: 87. Married Name Her married name was Kinloch. Married Name Her married name was Kinlock. Elizabeth Caldwell married Dr. Robert Alexander Kinloch. Elizabeth Caldwell was born on 2 September 1839 at South Carolina also reported as Sep. 2, 1834. She was the daughter of James E. Caldwell and Mary Gibson. Elizabeth Caldwell died on 25 March 1914 at age 74. Elizabeth Caldwell had 9 with 6 living in 1900 children. Name Variation Dr. Robert Alexander Kinloch was also known as Kinlock. Dr. Robert Alexander Kinloch married Elizabeth Caldwell, daughter of James E. Caldwell and Mary Gibson. Dr. Robert Alexander Kinloch was born on 20 February 1826 at South Carolina. He died on 23 December 1891 at age 65. Dr. Robert Alexander Kinloch was a physician in 1880. Name Variation James Caldwell Kinloch was also known as Kinlock. James Caldwell Kinloch was born on 18 October 1874 at South Carolina also reported as Oct 1873. He was the son of Dr. Robert Alexander Kinloch and Elizabeth Caldwell. James Caldwell Kinloch died on 16 May 1937 at age 62. Ida Kinloch was born circa 1873 at South Carolina. She was the daughter of Dr. Robert Alexander Kinloch and Elizabeth Caldwell.